Senator Elizabeth Warren waved to the crowd Saturday during her campaign kick-off event in Lawrence. 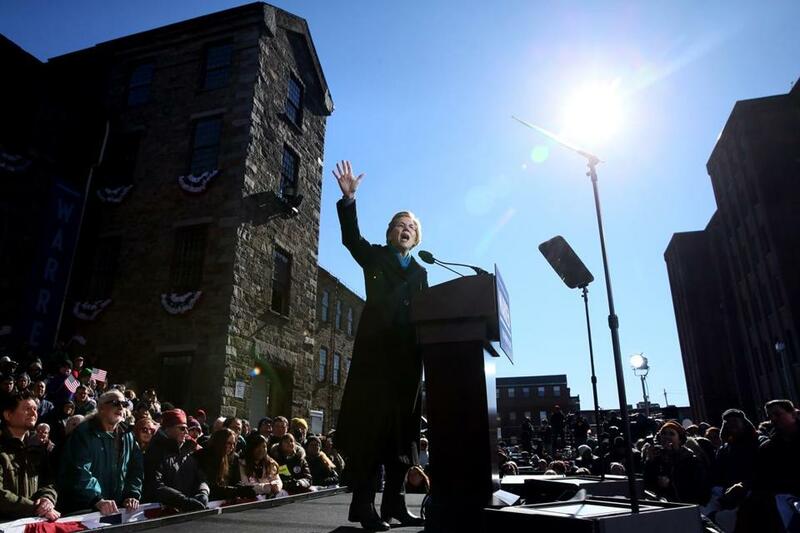 The gateway city of Lawrence was an inspired selection as the backdrop for the start — or, more accurately, the reboot — of Elizabeth Warren’s presidential campaign. As a city of immigrant workers where prosperity came to die in the early 20th century, it was the perfect place to launch fusillades against the modern-day plutocrats Warren says are ruining America, the merchants of greed who have “rigged” everything to shaft the rest of us. Make no mistake, Warren seemed to tell us over and over, their great wealth comes as no accident. Our stagnant wages are no mere byproduct of their actions. They are the deliberate strategic outcome of the men in suits, the guys with horns. “The richest and most powerful people in America were rich, really rich, but they wanted to be even richer — regardless of who got hurt,” Warren said, in one of her typical historical asides. 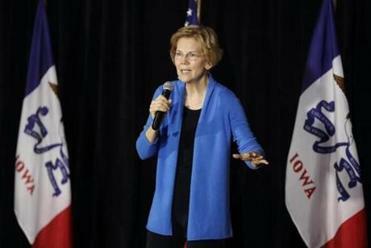 A day after beginning her presidential effort, Elizabeth Warren took her campaign to Iowa, and her topic, in part, was President Trump. She offered no evidence to support her assertion. Read: Tracker: Who’s running for president in 2020? The launch of Warren’s presidential campaign Saturday was an opportunity to define herself on her terms. She is going to run for president as the fiercest major-party foe of rich people in memory. Whether a majority of voters will buy the premise that a cabal of billionaires are to blame for most of our problems — from housing to climate change — is a question the campaign will answer. Warren didn’t mention the never-ending controversy over her Native American heritage in her speech. So of course, President Trump raised it for her — in a characteristically juvenile tweet that appeared to mock a signature tragedy in Native American history, the Trail of Tears. Warren, from Iowa, responded Sunday by saying Trump “may not even be a free person” by Election Day 2020 and suggesting we could all do worse than to just ignore him. A fine idea, though she seems no better at ignoring him than anyone else. Warren wants to run a campaign of ideas — but the one that really animates her campaign couldn’t be more simple. “They” are out to get “us” and it’s time we fought back, while we still can. So Warren called for everything from an end to lobbying to a Green New Deal to an Ultra-Millionaire Tax to Medicare For All. That is just a partial list of the things she vows to fight for to her dying breath. The battle between haves and have-nots has been central to Warren’s political persona from the beginning. But now it comes with an ever-longer list of bad guys, and prescriptions for reform. I lost count of the various bogeymen around the time she vowed to outlaw members of Congress owning stock, which is apparently corrupting. Many of her ideals are appealing, and some have been championed by liberals for years. But how far left do voters really want to go? Do voters really believe that anyone in the stock market is probably corrupt and only out for themselves? Warren’s campaign has had a bumpy launch, due to her inability to find a way to put the controversy over her ancestry to rest. So far, the questions it has raised about her judgment and political acumen have overshadowed her ideas about overhauling the economy. Whether she can overcome that will be her campaign’s first crucial test. Warren may turn out to be an imperfect messenger. But her campaign will also turn on the question of just how much change America has an appetite for. Not unlike Trump, she believes this nation’s rot runs deep. What she is offering isn’t a course correction; it’s a revolution. Adrian Walker is a Globe columnist. He can be reached at adrian.walker@globe.com.